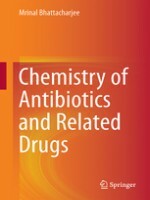 Chemistry of Antibiotics and Related Drugs, 1st Edition has been authored by Mrinal Bhattacharjee, who is an Associate Professor at Long Island University. This book discusses how the various types of antibiotics and related drugs work to cure infections. It also delves into the very serious matter of how bacteria are becoming resistant to these antibiotics. It explores multiple facets of this grave impediment threatening the domain of pharmacology as well as therapeutics. Appropriate for a one-semester course at either the graduate or advanced undergraduate level, this textbook contains worked examples of experimental procedures and interpreting data.